EyeCare for You opened its doors in the Spring of 2015. We are located in the Lake Pine Plaza (Kroger) on highway 64 in Apex, NC. We have a professional, but laid back approach at our optometry office that will make you and your family feel right at home. Our optometry office offers a full range of optometric services for all ages from infants to seniors. We are very grateful for the opportunity to serve Apex and Cary communities in which we live. We utilize the latest in technology in eye care to help ensure we get the best results possible. EyeCare for You is outfitted with specialized equipment to provide care and management of a wide range of eye conditions from diabetes to glaucoma to macular degeneration. The TRS is a refraction system used to help accurately pinpoint visual prescriptions for eyeglasses and contact lenses. The system can compare old prescriptions to new ones for you to see the difference your new glasses or contacts will make in your vision. This service is included with every annual eye exam. The iCare Tonometer is used to aid in diagnosing and managing the diseases that affect the internal ocular pressure (IOP) such as glaucoma. This tonometer provides instant, accurate IOP readings and does not use a puff of air, which is more reliable, and more comfortable for our patients. A check of your IOPs is included with every annual eye exam. The iCam is a specialized digital camera used to aid the diagnosing and managing various ocular diseases (i.e. diabetes, macular degeneration). 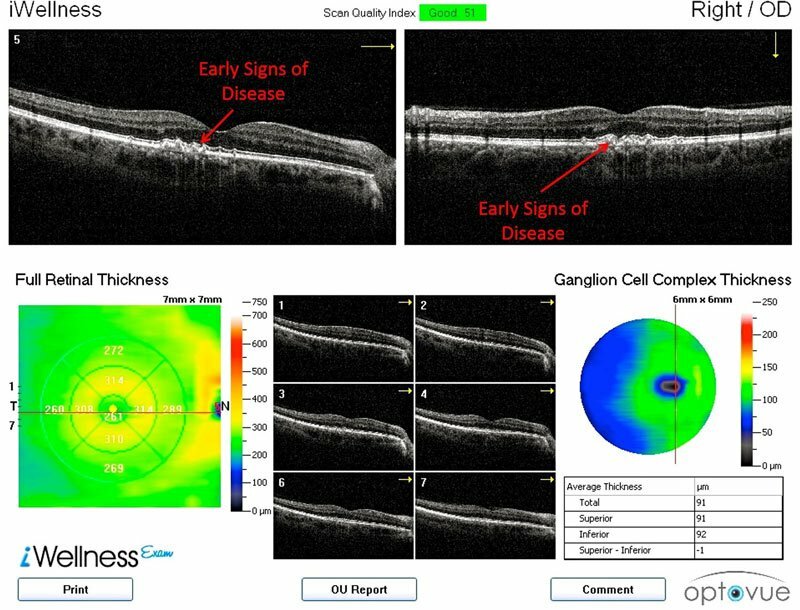 The system captures images of the inner structures of the eye to help document their current health status. A photo of the back of your eye is included with every annual eye exam. 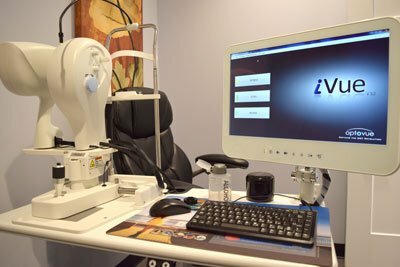 The iVue is a ocular imaging system used in the diagnosing and managing diseases that affect the thickness of the retina, optic disc, and cornea (i.e. macular degeneration, keratoconus). The system gives a three-dimensional scan of the inner eye to detect early eye disease and is used as a preventative care measure. This scan is included with every annual eye exam. The EasyField visual field system tests an individual’s ability to see in the periphery (the outer edges of your vision). It is used in the diagnosis and management of diseases that affect peripheral vision such as glaucoma. The system is also used to help monitor central vision of those patients taking medications that can affect your sight, like Plaquenil.